Conversations Change Lives | Arianna Merritt, M.Ed. Is there a common word that keeps appearing in your conversations recently? I find that when I’m being taught something important, the message is usually repeated in different situations throughout my life. That way, I’ll pay attention – even if I don’t want to! When talking to people over the past few months, many have independently mentioned how years ago I was “floundering” in terms of transitioning from recent graduate to established professional; now, they love how I have found my balance. Each has used that exact word, floundering, which means: “to make clumsy attempts to move or regain one's balance” (thefreedictionary.com). The reason the word was used was because I took a different route than what they were used to so they thought I was off course. However, I never thought I was "floundering," I used the term exploring instead. I knew exactly where I was going and working hard to get there. Looking back now that I have moved beyond the choppy waters of being a recent university graduate, I know what kept me moving forward: conversations. When you graduate you are encouraged to “go make it on your own.” However, hearing the stories of others who made it through the transition from new graduate to established professional and the lessons they learned along the way provided me with encouragement and support to persevere. Their words helped me regain my balance and stand tall. I now speak from the heart and share my story to provide others in the same boat with a lifeline of support, hope, and love. You see, life after graduation was not what I expected. I thought it would be easier to discover my career. I knew the end goal and where I wanted to go, but the path to get there was wavy and had unexpected roadblocks. There were times along the way where I got stuck and stayed constant because I was too ashamed of not being perfect and too proud to ask for help. Because my road to success wasn’t a straight one and I was honest about expressing what I was going through, some may have thought I had no idea where I was headed. I did, and I still know my way. If you stay in the safe and shallow waters, there will be no waves and you are protected. Yet, if you want to discover new seas and reach new places you have never been, you have to push yourself out of your comfort zone. I truly believe the path to landing your dream career takes hard work and perseverance. There will be floundering and road blocks, but you have to keep the faith! Yes, the boat may rock and you may lose your balance. Others may criticize or question your route because you are doing something or going somewhere that many others haven’t. Nevertheless, you have to keep going and not let the naysayers steer you off course. I know it can be degrading to your self-worth if you have been looking for a job for awhile and feel like there are no options. The situation can feel hopeless. Floundering for a long time is not fun and can make you seasick. When I was floundering, I started talking to others. These conversations provided me with clarity, caused me to regain the belief in myself, and helped me build momentum for the course. The connections brought me positive emotional energy because I felt supported and knew that I wasn’t alone on my path. So that I could be reminded of these valuable conversations, I wrote out my experiences in my journal and then created a blog. Look what has resulted from accepting my situation, expressing my thoughts, and looking for creative ways to move forward. Now, when I flounder a bit, I recognize it quickly and find my balance easier as have learned how to do so. 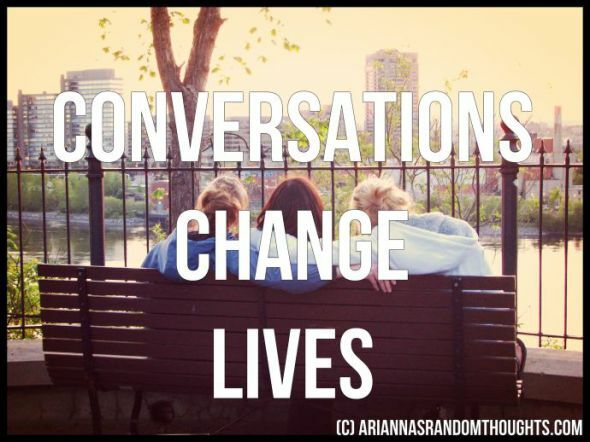 That is why I truly believe CONVERSATIONS CHANGE LIVES; they have nurtured my personal and professional growth! They can do so for you too. Starting in January – I’m going to begin conversations around questions I had when I was in my time of transition from university graduate to professional. I hope you will join in and add your voice to the conversation! Think back to a powerful conversation that really impacted your life. Describe it in detail and why was it meaningful to you? What resulted from that conversation?